In Mr. Robert Edge the Wolverhampton First Circuit has found an ideal steward. Few men are more loved, trusted and admired for their fine Christian character, their large-heartedness, their long and splendid record of service in the Church, than he. He was born in 1841; came to Wednesfield in 1850, became a scholar in our school in 1852; a member of the Church, and teacher in the school in 1856. He has filled the position of Superintendent for nearly forty years, served as Secretary to the Trust for forty-nine years, been a local preacher for forty-five years, Circuit Secretary many years, and Circuit Steward for over twenty years. He is an ardent temperance worker, being a total abstainer of fifty years’ standing. He has been a delegate to six District meetings, and one Conference; is a generous supporter of Circuit and Connexional Funds and Institutions, has served on several occasions as Missionary deputation, and is the father of the wife of Rev. 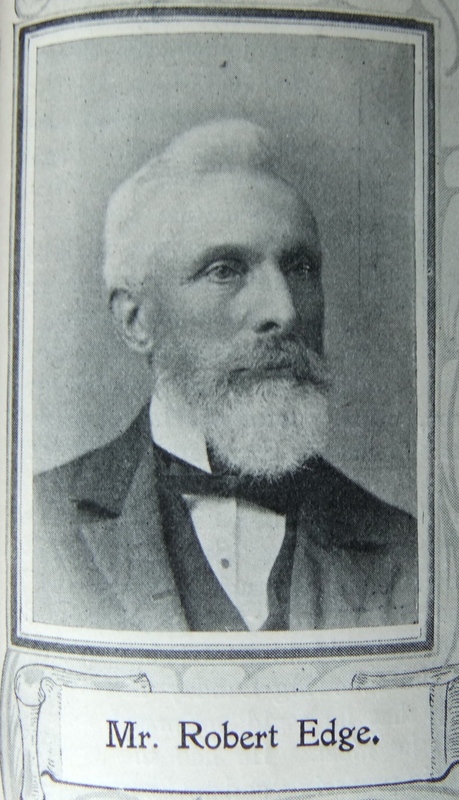 R. Banham, who has distinguished himself as one of our most earnest and devoted missionaries. Robert was born in 1841 at Wolverhampton, Staffordshire, to parents Samuel and Mary. Samuel was a stone miner. Robert married Rachel Cooper (1840-1903) in late 1864 in the Wolverhampton Registration District. Census returns identify five children. Robert married Mary Matilda Cole, nee Gilbert (1867-1952) in the summer of 1905 at Wednesfield, Staffordshire. Census returns identify one child. Robert died on 25 September 1913 at Wednesfield, Staffordshire.